The TOC control list gives you the ability to integrate a report with a Table of Contents and On Demand Paging in HTML Composer. Note: TOC controls cannot be associated to any parameters in the layout. This type of control can only be associated with certain input controls in the layout. For more information, see Integrating a Report With a Table of Contents and On Demand Paging. Input control objects. You may select the input control object to view and edit the Properties and settings of the control. Creating an input control from the Design view prompts you to create a bound parameter on the Parameters tab. For details, see Using Input Controls to Supply Parameter Values. Editing an input control, which is inserted when setting input controls for new parameters. For details, see Automatically Creating Controls From the New Parameters Dialog Box. Add new parameters. Right-click anywhere on the Parameters tab to add a new parameter. Note: Manually adding a parameter creates an unbound parameter. For details about adding new parameters, see Adding a New Unbound Parameter. Refresh unresolved parameters. All parameters on the parameters tab are parsed every two minutes to check if any are unresolved. If there are, their surrounding polygon is colored red. If you want to check for unresolved parameters on demand, right-click and select Refresh unresolved. Binding controls and parameters. Input controls and parameters can be bound and unbound from the Parameters tab. Chain one control to another. Chaining will populate controls based on the selected value from the prior control in the chain. 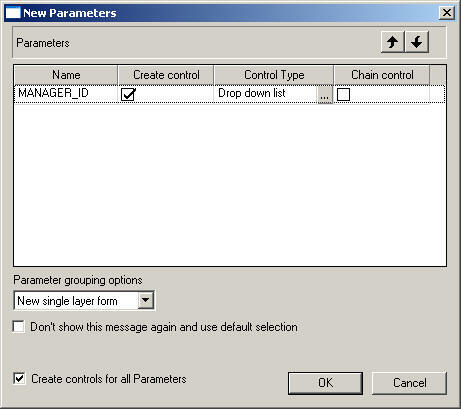 You can chain static and dynamic controls, link or unlink parts of a chain, and create conditions on links in a chain. Chains are represented by lines connecting control objects on the Parameters tab. By clicking the arrow head in a link of a chain, the Properties and settings dialog box enables you to modify and set properties and conditions of the chain. Note: Chaining is applicable only for controls, not parameters. For details about chaining, see Chaining Controls for Dependencies in HTML Composer. If using a single value, select Single select. Note: If opening HTML Composer with an existing page from a previous release and the tool cannot resolve the Value and Display fields, XML index values appear for the fields instead. If creating a new page that cannot resolve the Value and Display fields, you can manually type them in the Properties and Settings dialog box from the Parameters tab, or leave them blank. Unresolved Value and Display fields occur as a result of -INCLUDE, or amper variables, that may exist in an existing procedure. Close the Properties and settings dialog box to create an unbound parameter. To modify the parameter value, right-click the parameter on the Parameters tab and select Properties and settings to make your edits. Tip: You may also use the Undo and Redo buttons located on the Standard toolbar. Note that the undo/redo buttons treat the entire Properties and settings dialog as one action. Optionally, bind a control to a parameter to populate the parameter. Select the center of the parameter name object, left-click and drag the parameter to the center of the control object, and release the mouse to complete the binding. Optionally, bind the new parameter to a control to create an incoming parameter. Select the center of the control object, left-click and drag the control to the center of the parameter object, and release the mouse to complete the binding. For details about creating an input controls, see Using Input Controls to Supply Parameter Values. Note: The No selection option is unavailable for tree controls, calendar controls, text area controls, and slider controls. You may create an unbound static parameter, an incoming static parameter (a parameter that is bound to a control), or a control that is bound to a static parameter. For details, see How to Add a New Static Value. The Properties and settings dialog box appears when creating or editing a static value on the Parameters tab. The following image is the Properties and settings dialog box that appears for an incoming static parameter (a parameter that is bound to a control), and an unbound control (a control that is not bound to a parameter). 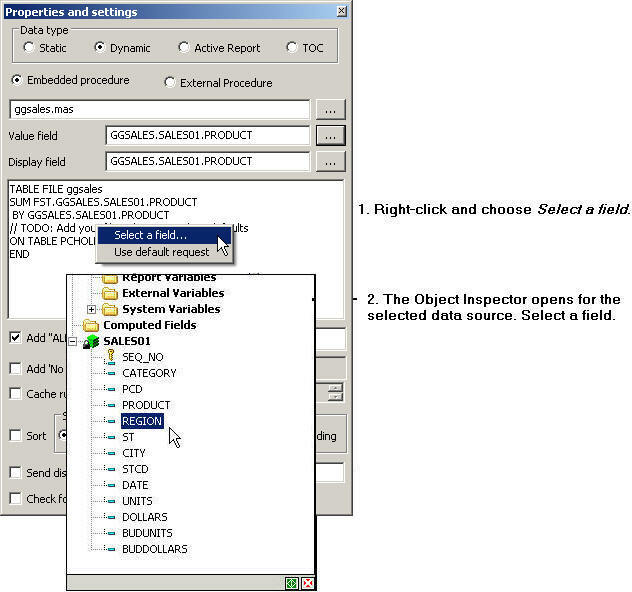 The Properties and settings dialog box contains the following fields and options when Static is selected as the Data type. Determines whether values are obtained from a static or dynamic list, an active report, or Table of Contents. Static. Uses a static list of values you supply. A list of static values can also be created in Report Painter. For an example of importing static values that were created in Report Painter, see Adding Static Field Values From Report Painter. 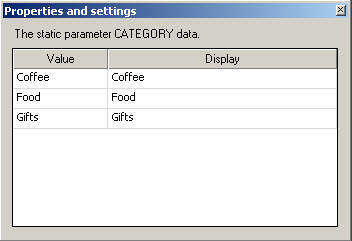 Select this option to send the display value, rather than the actual data, to the parameter. For more information, see How to Send the Display Value for Static and Dynamic Controls. For more information on how to use the Values are procedures names option, see How to Use Procedure Names as Values. The following image is the Properties and settings dialog box that appears when adding a new unbound parameter. The Properties and settings dialog box contains the following fields and options when adding an unbound parameter with Single select. Single select is the default option when adding a new parameter. The Properties and settings dialog box contains the following fields and options when adding an unbound parameter with Multiselect OR or Multiselect AND, as shown in the image below. 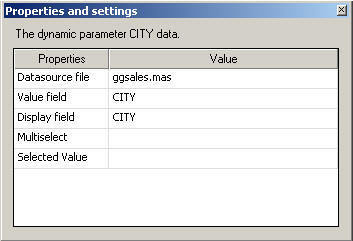 The Properties and settings dialog box appears when selecting a bound parameter on the Parameters tab. The Properties and settings dialog box for a parameter is read-only and displays the values for the bound control. The following image is the Properties and settings dialog box that appears when selecting a bound static parameter. The steps below describe how to manually add a new static value. Select the center of the parameter name object, left-click and drag the parameter to the center of the control object, and release the mouse to complete the binding. The following image is an example of an incoming parameter. Notice the direction of the arrow. From the Design view of HTML Composer, select a control from the Controls sub-menu of the Insert menu. For example, insert a list box or a drop-down list. Close the Properties and settings dialog box to create the control with static values. Bind the new control to a parameter: Select the center of the control object, left-click and drag the control to the center of the parameter object, and release the mouse to complete the binding. The image below is an example of a control that is bound to a parameter. Notice the direction of the arrow. To modify the static value, right-click the control or parameter on the Parameters tab, and select Properties and settings to make your edits. Instead of adding new static values, you may also import static value parameters that you created from the Variable Editor. 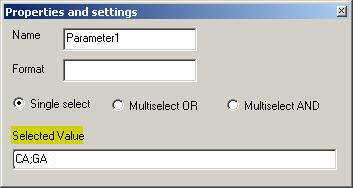 Parameter values can be data values to limit your data or field names to select the fields in your report. Both types of static lists can be created in Report Painter. 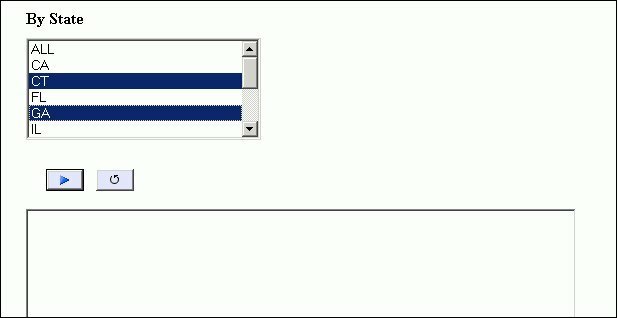 This example details how to supply field values to a report through HTML Composer and Report Painter. For the purposes of this example, use the CAR Master File (car.mas) that is supplied with Developer Studio. Right-click the report object and select New Report. 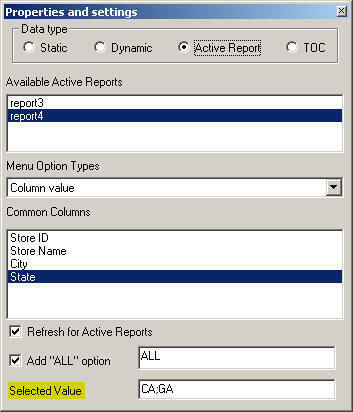 From the Report Painter Object Inspector, right-click Report Variables and select New Report Variable Field. Select Static List from the Accept List section. Right-click Report Variables and select New Report Variable Field. Select Multiselect AND from the Variable Type drop-down list. You are returned to HTML Composer. Since you are adding a report with parameters, the New Parameters dialog box appears. From HTML Composer, use controls to supply parameter values for a report. This is the default option which populates the static list with field names predefined in the procedure. The use values from procedure option is available for Multiselect OR and Multiselect AND static parameters, and when adding static field values from Report Painter. The field names from the procedure appear in the Properties and settings dialog box. The external file can be a comma-delimited file with single values on each line, or two values per line. You may also create new dynamic parameters by adding a filter to a report or graph component in the layout. For details, see How to Create Dynamic Parameters by Adding a Filter. The Properties and settings dialog box appears when creating or editing a dynamic parameter on the Parameters tab. The following image is the Properties and settings dialog box with a Dynamic Data type. Dynamic uses a list of values retrieved from a selected data source when the request is executed. This is the default if you use an Accept clause in a Master File to create an amper variable parameter within a procedure. For more information, see How to Create a Dynamic Value. You may modify the external procedure directly from the Properties and settings dialog box on the Parameters tab. If you modify the request, you can save the external procedure and overwrite the original request. Tip: You may manually edit the source code if you are familiar with WebFOCUS syntax. For example, you may right-click and choose Select a field from the data source to add to the request. Or right-click and choose to Use the default request. The //TODO line must remain in the source code in order to resolve filters at run time. An example of this is when filters are based on chains that have conditions. If you want your own filters specified, then delete this line. Tip: You may manually edit the source code if you are familiar with WebFOCUS syntax. For example, you may right-click and choose Select a field from the data source to add to the request. After editing the external procedure that is associated with a control, right-click and choose Reload external procedure to reload and display the new syntax in the Properties and settings dialog box. Or right-click and choose to Save external procedure. Saving the external procedure overwrites the original requests. Adds the option to select ALL data source values to the control. Alternate text can be substituted for ALL using the text field to the right. For more information, see Parameter Value List Options. Optimizes performance by populating a chain one control at a time, instead of all the controls when the page initially loads. Selecting the Add ‘No selection’ option enables you to populate controls when necessary. This setting overrides the Default caching option from the HTML Page tab, which is located in the Developer Studio Options dialog box. For more information about the HTML Page tab, see HTML Page Tab. When Sort is enabled, you may sort the display value by the Value field or the Display field selected from the Properties and settings dialog box. The default is Value field. Enter the value(s) to be selected as the default value whenever the procedure is run. For more information, see How to Use Selected Values as the Default Value. 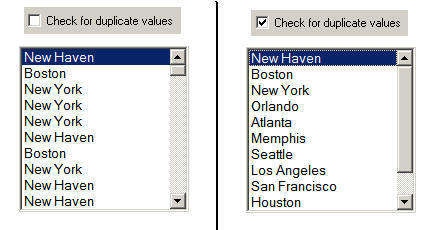 When creating a dynamic list of values for a report, you may remove duplicate values from input controls. For more information, see How to Check for Duplicate Values. 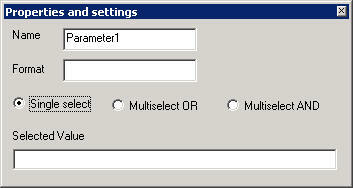 The following image is the Properties and settings dialog box that appears when selecting a bound dynamic parameter. From the Design view of HTML Composer, select a control from the Controls sub menu of the Insert menu. For example, insert a list box or drop-down list. The cursor changes into a crosshair. Click the Parameters tab. The Properties and settings dialog box opens. To remove any syntax that you added, right-click and select Use default request. 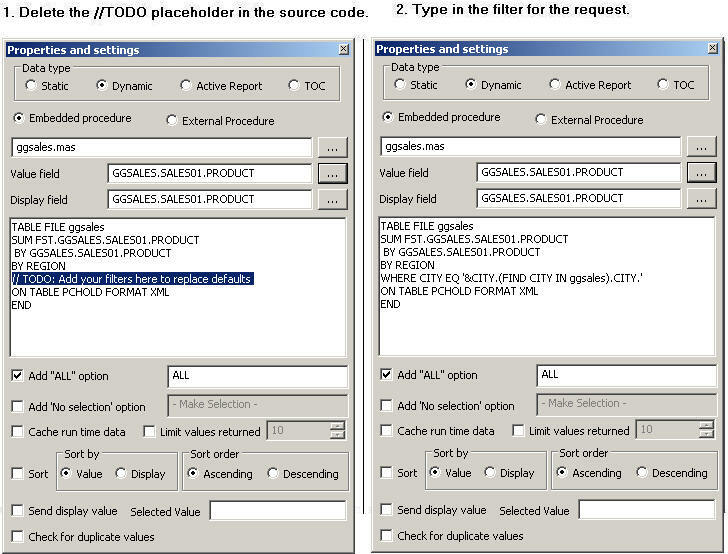 The parameter names from the procedure are automatically added to the Value field and Display field, and the source code for the external procedure appears. For details, see Automatically Populating Fields With Dynamic Values. If you modify the request that is associated with a control, you can right-click and choose Reload external procedure to reload and display the new syntax in the Properties and settings dialog box. Or right-click and choose to Save external procedure. Saving the external procedure overwrites the original requests. Note: For more information about how a procedure can be used to populate a dynamic list of values, see Using Custom Procedures to Retrieve Dynamic Values. 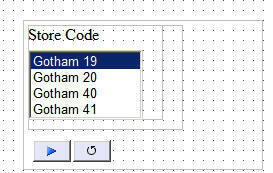 Optionally, select the Add "ALL" option to add the select ALL data source values to the control. Optionally, select the Add 'No selection' option to optimize performance by populating a chain one control at a time instead of all the controls when the page initially loads. Optionally, select the Cache run time data option to cache the run time data for the selected input control. Optionally, select the Check for duplicate values option to remove any duplicate value entries from the input control at run time. Bind the new control to a parameter. Select the center of the control object, left-click and drag the control to the center of the parameter object, and release the mouse to complete the binding. The following image is an example of a control that is bound to a parameter. Notice the direction of the arrow. To modify the dynamic value, right-click the control and select Properties and settings to make your edits. To create dynamic parameters for your report or graph in the Design view, right-click the report or graph object and select Add a filter from the context menu. You may select a control type for the parameter from this dialog box, or adjust them later using the Properties and settings dialog box on the Parameters tab. If the New Parameters dialog box does not appear, ensure that Show New Parameters dialog is selected from the HTML Page tab. To access the HTML Page tab, select Options from the Window menu to open the Developer Studio Options dialog box. From the Developer Studio Options dialog box, select the HTML Page tab. The following image are the sort options that appear on the Properties and settings dialog box of the Parameters tab, when a dynamic control is selected. From HTML Composer, create an input control with a dynamic list of values. The Properties and settings dialog box opens for the input control. Close the Properties and settings dialog box to save your selection. If caching is enabled for the parameter values, a single procedure can be used to populate the controls of the chained variables. In this case, HTML Composer writes the WHERE criteria. For details about enabling caching options for chained controls, see How to Enable Cache Processing for Chained Values. Note: The procedure does not have to follow this FOCUS syntax exactly, but the end result must be two values per data line in XML format. In the following example, caching is enabled, so a single procedure is used to populate the controls. For details about caching options, see How to Enable Cache Processing for Chained Values. When the name of a dynamic parameter matches a corresponding field name in a data source, HTML Composer automatically populates the field name values for the parameter. The data source is populated by a default based on the first data source specified by a TABLE FILE or GRAPH FILE command. The data source field is populated for the Value and Display fields in the Properties and settings dialog box of the Parameters tab (when Dynamic is selected as the Data type). This generates a layout report that is ready to run as long as the parameter names match the field names. When the following report request is called from HTML Composer with a push button control, the Properties and settings dialog box for the PRODUCT parameter on the Parameters tab is automatically populated to dynamically retrieve the values of the PRODUCT field. When using a Dynamic or active report Data type, you may enter the value(s) to be selected as the default value whenever the procedure is run. For more information, see How to Use Selected Values as the Default Value. Note: You may also enter the selected value when adding a new unbound parameter on the Parameters tab. For more information, see Adding a New Unbound Parameter. From HTML Composer, you may send the display value, rather than the actual data, to the parameter. The display value can also be used for headings and footings in the report output. From HTML Composer, import or create a report that contains a parameter. The report and control type is added to HTML Composer. Note: The options available in the Properties and settings dialog box vary, depending on the type of values (static or dynamic) you are creating. For a static list of values, the Value, Display, and Selected columns appear on the Properties and settings dialog box. Tip: You may also update the display values from the Variable Editor in Report Painter. For more information about static values, see Creating a Static List of Values. Click the Design tab to view the display values in the control object of HTML Composer. For a dynamic list of values, the Value field and the Display field appear on the Properties and settings dialog box. The parameter names from the procedure are automatically added to the Value and Display field, and the source code for the external procedure appears. Optionally, select Add 'No selection' option to optimize performance by populating a chain one control at a time, instead of all the controls when the page initially loads. The following image is an example of the Properties and settings dialog box with Send display value selected for a dynamic value. Tip: For details about the //TODO line in the source code, see Creating a Dynamic List of Values. For more information about dynamic values, see Creating a Dynamic List of Values. Optionally, you may add a heading to the report to show the display value. Double-click the report from HTML Composer to open and edit the report. For example, the image below shows the heading as Display Value: &STCD_TEXT, where Store Code (STCD) is the variable name. Save and close the report to return to HTML Composer. When you create the Text variable (&Variable_TEXT), you are not prompted to set a control type for this variable when returning to HTML Composer, as no control type is needed. 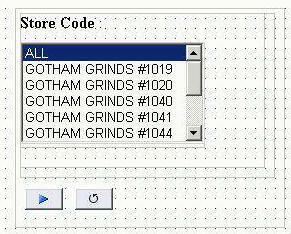 For example, in the image below, Gotham 40 is selected as the Store Code and shows the display value in the report heading. The actual value, R1040, is shown in the Store ID column. Note: HTML Composer passes &var_TEXT if the report procedure uses it, regardless of whether the send display value check box is checked or unchecked. Create an HTML page that contains a list box, a push button, and a report. Note: In this procedure a list box is used. However, the following controls are also able to use the Values as procedures names option: double list, drop-down, radio button, and check box. Select the list box to bring up the Properties and settings dialog box. Note: If the Properties and settings dialog box does not open, select View and click Properties and settings. 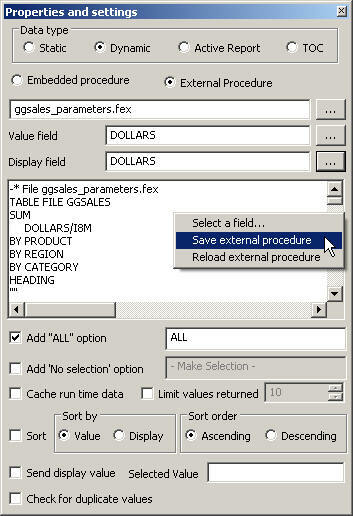 At the bottom of the Properties and settings dialog box, select Values are procedures names, as shown in the following image. Click the New button and select procedures from your directory, as shown in the following image. Note: You can add multiple procedure names to the Properties and settings dialog box by multiselecting procedures while in the Get source file dialog box. Once the procedures has been added to the Properties and settings dialog box, edit the display name of the procedures value by double clicking the display contents if they are not highlighted already. The following image shows the procedure values with new display names. Right-click the button you created and click Create Hyperlink. The Hyperlink Properties dialog box opens. For the Action, select Procedures from control from the drop-down list. This option coincides with the Values are procedures names option found in the Properties and settings dialog box. This option will point to an entire procedure for the hyperlink, rather than a simple value. This option is only available when a control on the HTML Page is using the Values are procedures names option. The created hyperlink is shown in the following image. Select the procedure from the list box and click the button. The report is run, as shown in the following image. If you import a procedure (.fex) that has a dynamic prompt value, then the input box is populated with values retrieved from the data source. 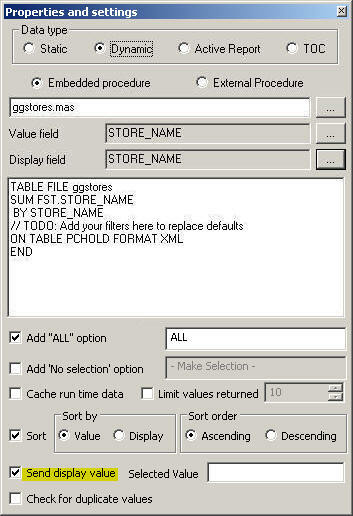 If the selected value is available in the data source, the value(s) are selected by default. 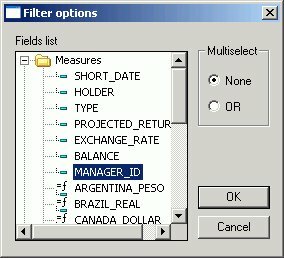 If the selected value is not available in the data source, then the value(s) that you entered are ignored and the first value retrieved from the data source is selected. To enter the selected value to be used as the default value, select the control object (for example, select listboxn) in the Design view and click the Parameters tab. 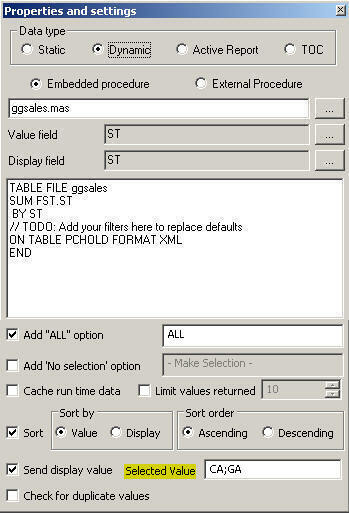 The following image is an example of the Dynamic Data type Properties and settings dialog box, with parameter values in the Selected Value field. For an active report list of values, the Available active reports, Menu Option Types, and Common Columns appear on the Properties and settings dialog box. Select the Menu Options Types for the active report control to sort, filter, list or select columns. You can also change presentation styles of the bound active report and the associated report and graph objects synchronized to the active report. Note that even though one value in the last set has the embedded comma, both values need to be enclosed in double quotation marks (" "). For more information about active report values, see Creating Active Technologies Dashboards With HTML Composer. 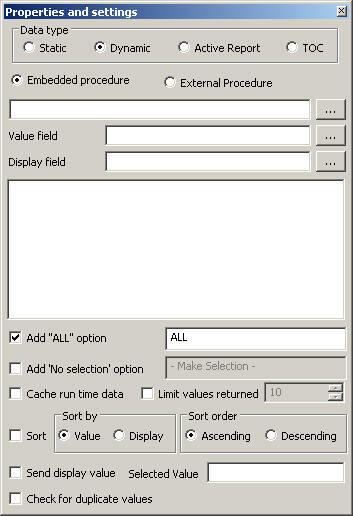 The following image is an example of the active report Data type Properties and settings dialog box, with parameter values in the Selected Value field. For a single-select unbound parameter, the Selected Value input field appears on the Properties and settings dialog box. For more information about single-select parameters, see Adding a New Unbound Parameter. The following image is an example of the Single select parameter Properties and settings dialog box, with parameter values in the Selected Value field. The example below shows CT, GA as the selected values in the State parameter list in the report output. When using HTML Composer, if changes are made to parameter values in Report Painter, you may want to update the values in HTML Composer with those entered in Report Painter.